Calling all treasure-seekers! 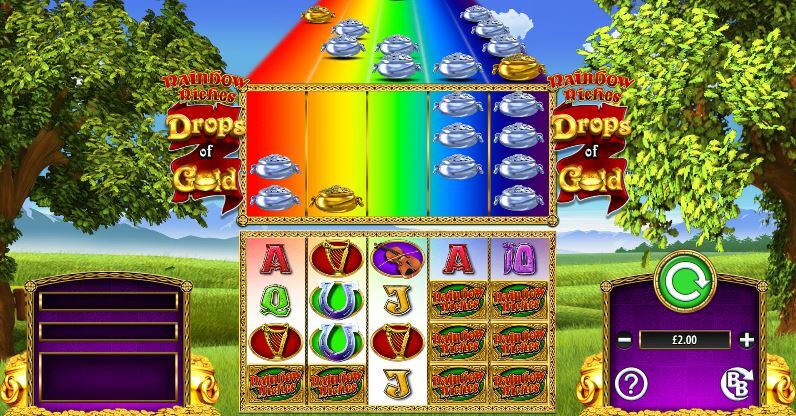 Rainbow Riches: Drops of Gold is available for you to play now at Rocket Slots. This exciting slot is the most recent instalment in Barcrest’s Rainbow Riches series and it definitely lives up to its legacy. Set against a beautiful Irish landscape, Drops of Gold will certainly keep your eyes entertained as you spin those reels and try to catch a mighty prize. The colours are fantastically vibrant, from the rich purples used on the tiles and control panels to the reds of the logo’s banners. There are many beautiful tiles available in slot games and Drops of Gold can proudly join that list. The upper reel with its rainbow track and its glorious gold and silver pots takes 1st prize here but the smart design of the tiles on the lower reels are in no way lacking. You may recognise the A, K,Q,J, and 10 symbols if you are a slot aficionado and these have all been carefully designed to fit the overall theme of the game. Other symbols have also been chosen to fit the Irish luck theme so loved by the Rainbow Riches series. Watch out for a silver horseshoe, a golden harp, a wooden fiddle, a clump of mushrooms, and the Rainbow Riches tile. When players first see the upper reel, they may worry that this is a particularly difficult or challenging slot. There is no need to fear; Drops of Gold is actually fairly simple to learn how to play. At the simplest, all a player needs to do is press the spin button on the right-hand side of the game screen. However, if you would like a little more control, you can also change your bet using the controls below the spin. The purple screen to the left of your reels informs the player of their wins. It shows not only how much they have won, but how many paylines they have won across too. As with many other slot games, you can bet that Drops of Gold has fantastic bonuses. Collect a Drops of Gold banner on the 5th reel to bring the pots of the upper reel down to become those lucrative wild tiles we all know and love. Also keep an eye out for 3 or more bonus tiles as they will send some Free Spins headed your way. The best and brightest feature in Drops of Gold is the Big Bet. When you play a Big Bet, you are given 5 spins and specially altered reels to help you land a phenomenal win. With a £20 Big Bet, the Drops of Gold Banner is doubled in height meaning more chance of a pot dropdown and more chance of rainbow wilds. With £30, not only do you get the bonus of the £20 bet but the lowest paying symbols are also eliminated meaning you have a greater chance of landing a higher win. Finally, a £50 Big Bet not only scores you all the benefits of the lower 2 tiers but 100 active paylines and the chance to play across al 200 of the paylines the game has to offer. Come on, try your luck! Play Rainbow Riches; Drops of Gold at Rocket Slots today!